Saint Patrick’s Day went south forever for me when I had the misfortune to win a high school essay contest about democracy. The sponsors (the Lions Club or something like it) had the bright idea to plunk me on their float in the Holyoke, Massachusetts, St. Patrick’s Day parade, the third largest in the United States after New York and Boston, at least at the time. Before I could respond with horror at the thought my mother gleefully accepted for me. I had to sit up there for hours with a frozen smile (due to my mood and the extreme cold) in a formal dress and borrowed mink stole. Not good. I often wonder why corned beef and cabbage has become so wildly popular at this holiday. If Americans really liked it, they’d have it more often. Made well, it’s a good dish. But the watery steam table meat and overcooked cabbage that make their appearance every March 17 are not representative of Irish cookery, although it certainly is true that these inexpensive foods have long been staples in the Emerald Isle. Instead, give me some nice Irish salmon. Travelers to Ireland find this wonderful fish is widely available, and the restaurants come up with delicious preparations. 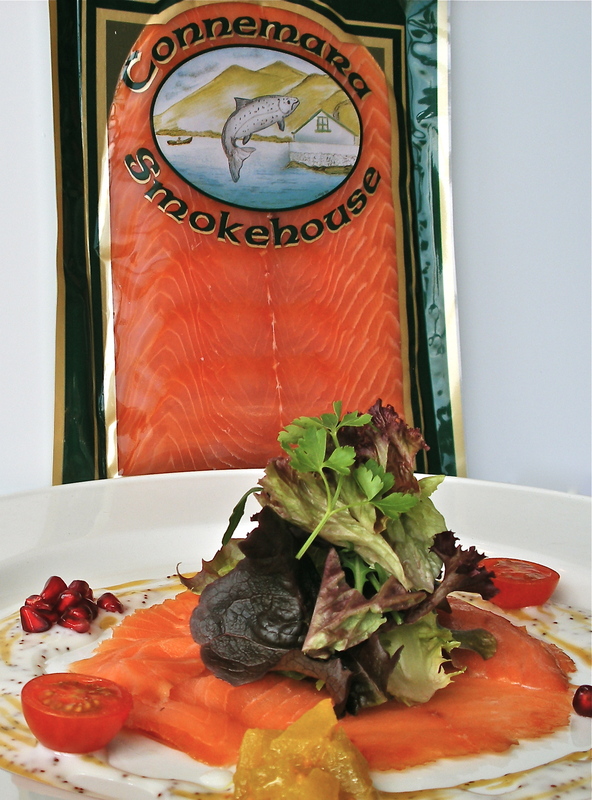 Smoked Irish salmon is also a great treat, and available at good delis here. 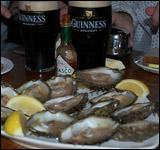 Then there are the Galway oysters, another goodie for the traveler to seek out. And, for that matter, any kind of seafood will be a find on this little island. The quintessential Irish stout, Guinness, makes a big St. Patrick’s Day splash, pumping large sums of money into promotions to gain the largest possible share of this big beer drinking festival. It is actually lower in calories than most beers (other than the “light” beers), and is a classic accompaniment to those famous oysters. As for other beverages, Irish whiskey is like a cross between Scotch and Canadian: in a nutshell, the same ingredients as Scotch with the Canadian production method (no smoking of the barley). I’ll leave that, Irish coffee made with it and green beer, to the leprechauns. 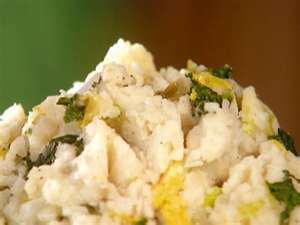 On the vegetable side, my favorite is Colcannon, a homey dish which is incredibly easy to make: boiled potatoes and chopped cooked cabbage (or kale) mashed together with butter, salt and pepper. If you really want to be decadent, make a pool in the center and throw on a pat of butter (maybe some real Irish Kerrygold in honor of the holiday). I’ll celebrate this year’s warm weather St. Patrick’s Day by avoiding parades and sipping some Vinho Verde (green wine, not from the color but because it is bottled and consumed very young) from Portugal. And maybe roasted salmon with steamed baby bok choy, not very Irish, but in the right spirit. I’ll never forget the most wonderful, fluffy poached salmon I had in Ireland. I honestly like corned beef and cabbage (with nice grainy mustard) , but this salmon was the nest thing I had ever tasted. I’ll skip the green beer too, but give me a nice Irish coffee (or two) anytime! Thanks for the tidbits on making Colcannan: boiled potatoes and chopped cooked cabbage (or kale) mashed together with butter, salt and pepper. Sounds yummy. Being born and bred from the Boston area – all things Irish were well known, but not this recipe!! What about Irish Soda Bread….another of my favs. Comments. Good story again. I love Colcannon potatoes. In my new book: “Peeking behind the Wallpaper” I mention when I worked at Shannon Airport in 1952 Corned Beef and Cabbage was not on the menu and not served on St. Patrick’s Day . You are so right, Irish Smoked Salmon is wonderful! I was told that in Ireland,. it’s ham and cabbage and not corned beef and cabbage that is the popular dish.